Yesterday I decided I couldn’t be bothered to bleach my roots any more. So instead of having a blue fringe, my entire hair is black again. I have to say that I was thinking about this for at least two weeks. 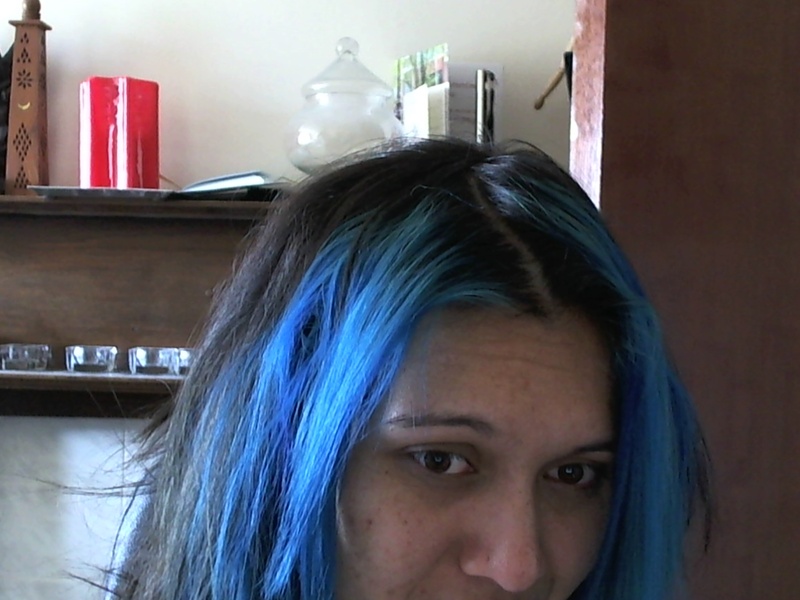 I loved my blue hair, but I am incredibly lazy when it comes to maintaining it. Second thing that made me want to dye my hair black again are the comments. It seems that if you are looking slightly different than the average Joe or Betty, it’s all of a sudden ok to get random comments thrown towards you. Now you can get really positive comments, sure. I got some amazing comments about how people loved my blue hair. However, I also got people yelling at me from windows and laughing about the colour of my hair (in which I told them that they were incredibly rude and that I might have blue hair, but at least my mother told me to be polite, something they seemed to lack. In the end it did shut them up. ), or people who think they can make these random little snide remarks or jokes. You see this a lot though; I’ve seen people getting mocked or getting rude remarks just for dressing differently or having piercings and tattoo’s. It is absolutely beyond me why all of a sudden that would give a person the green light to be rude. How come you can’t seem to say anything to a person who looks ‘normal’? Perhaps they are not creative enough, unlike the people they feel necessary to mock. I am silently mourning the end of having blue hair, but I do think that it will be a lot quieter in my life. Unless, of course they find something else to yell at me. Perhaps the fact that my skin isn’t white (yes, this has happened to me too. You’ve got to love racists *sarcasm*) Now don’t get me wrong. I didn’t like the comments, but I have a pretty thick skin and I can stand up for myself. Besides, should we really care about the opinion of people who feel the need to talk others down because of their own insecurities? For anyone else out there who is thinking of dying their hair a funky colour: go for it! Just don’t be lazy like me and actually make sure you are ok with bleaching your roots over and over!